So, this is the first month in a while where I have had to wait like everyone else to find out the colour for the monthly challenge over at WW1! A bit weird but that's ok, now I can join in and enjoy the new teams creations! A little hard to match perfectly, reds seemed to be too warm or too blue or too pink. Anyhoo, I think the colour I found was a pretty good match, and I had some fun creating the background that is for sure! What else that was really fun was playing with the Charms Creations DIY heart. There are shapes available in white and cream calico so you can do whatever you want to make it fit your project! Pretty cool hey?! This heart started off white and I stamped a pattern using a cool Hero Arts stamp and clear embossing ink and then sprinkled with clear powder and set the pattern. Once it cooled downed I sprayed my ink, in this case I used dylusions cherry pie, onto my craft mat with some water, swiped the heart through, sprayed a bit more water directly on the heart to help the colour spread and finished with a little more ink directly on the heart also. 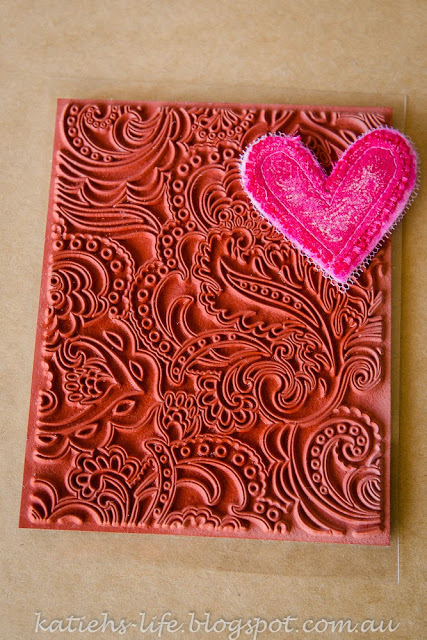 The result is essentially an emboss resist pattern on the heart. I am thinking maybe the pattern was too detailed for the small scale, so I need to play around a little more, but it definitely worked! After it dried off a little I used a hot dry iron and some butchers paper and ironed off the embossing. You can see the detail a little better in the close up. I also cut out some gorgeous Wilna Furstenburg flowers and leaves to surround my photos and coloured the word in black to make it my title. A pretty simple page, but I love how it turned out! So there you have it, my first WW1 entry in ages! Looking forward to doing more. Totally cool idea Katie. Might have to try something like this myself. This looks gorgeous. love all the work on your back ground.. and... thanks for joining in with White With One this month! Gorgeous page! Thank you for playing with our "Raspberry Wine" challenge at White with 1! 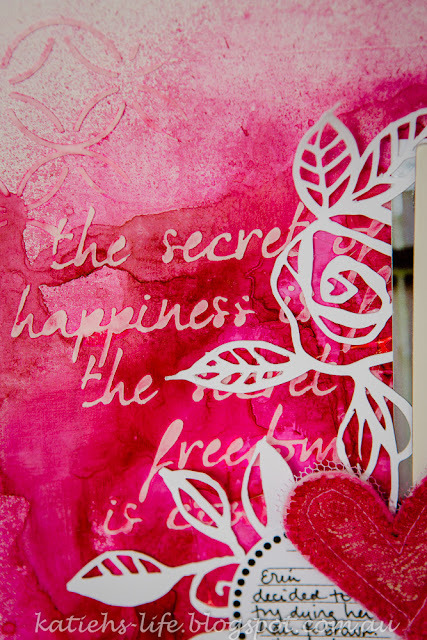 Just beautiful - love that background and REALLY love how you altered the Charms Creation heart! Thank you for joining in at White with 1!